Mackay Regional Botanic Gardens features the flora of the Central Queensland Coast bioregion. This special region around Mackay represents a higher rainfall than the surrounding countryside; containing flora often found nowhere else in Australia. From the stunning high altitude rainforests of Eungella National Park, through to the Whitsunday Islands, Mackay Coastal Lowlands and extensive waterways - the Mackay Regional Botanic Gardens showcases this flora - and representations of the diverse landforms of the bioregion as well. Queensland has been divided into thirteen bioregions based on broad landscape patterns reflecting geology and climate and fauna and flora assemblages. The Central Queensland Coast bioregion covers an area of approximately 1.5 million hectares and is surrounded by the dryer Brigalow Belt bioregion, which reaches the coast around Bowen in the north and Clairview and Yeppoon in the south. Climate in the region is characterised by sub-tropical to tropical climate with a distinct wet season when 50-60% of the average annual rainfall (1300-2000mm) falls between January and March. Severe tropical cyclones occasionally hit the central Queensland coast with high winds and very heavy rainfall and can cause extensive damage to the natural and human built environment. Biodiversity is simply the variety of life, including plants, animals and microorganisms, and the environmental conditions necessary for their survival. Biodiversity includes genetic diversity (variety within a species), species diversity (variety of species) and ecosystem diversity (variety of ecosystems). 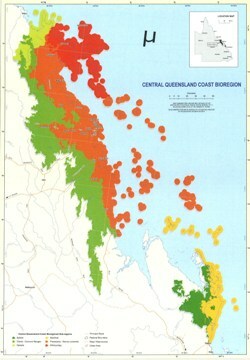 The Central Queensland Coast bioregion has unique biodiversity values worth conserving for future generations. Seventy-five distinct regional ecosystems derived from landscape patterns, geology, landform and vegetation, have been identified in the bioregion providing a diversity of habitats for over 550 native animal species and 2,200 native plant species, including species found nowhere else on earth. The mountainous terrain of the Clarke-Connors Ranges, from Proserpine to Carmilla, forms the western edge of the bioregion and supports large tracts of broad-leaved evergreen rainforest and tall eucalypt forest. These high altitude rainforests have close affinities with north Queensland’s Wet Tropics flora highlighting this areas importance as refugia from climatic extremes. During dryer periods such as ice ages, the rainforest survived in small pockets on mountain slopes and when conditions became wetter, the rainforests expanded. Savanna woodlands and semi-deciduous rainforests extend across lower altitude parts of the bioregion and are more closely linked to the vegetation of southern Queensland. Coastal and estuarine mangrove communities provide habitat for a large number of specialised fauna and flora species restricted to these ecosystems, as well as breeding sites for many marine fish species. Other coastal habitats in Central Queensland have high biodiversity values including saltpans, sand dunes, rocky headlands, freshwater wetlands, and marine seagrass and coral reef communities. Many protected areas have been dedicated for nature conservation in the bioregion. Eungella National Park is well known for its large expanse of upland rainforest and views of the Pioneer Valley from the top of the Clarke Range. It is also the largest National Park in the bioregion (52 900 ha) and protects a range of ecosystems including semi-evergreen vine thickets with Hoop Pine Araucaria cunninghamii emergent, wet upland forests of Flooded Gum Eucalyptus grandis and New England Blackbutt E. montivaga, and dryer open forests and woodlands on the western edge of the park including Blue Gum E. tereticornis, Lemon-scented Gum Corymbia citriodora and Ironbark E. crebra dominated communities. Conway National Park and Conway State Forest protects the largest remaining area of lowland rainforest in the bioregion, located in the Repulse/Impulse Creek valleys. Byfield National Park includes wet heath complex on sand plains and notophyll vine forest dominated by Piccabeen Palm Archontophoenix cunninghamiana on parabolic dunes. State forests such as Cathu, Crediton and Conway State Forests, are protected areas that attract visitation for their nature conservation and recreation values. The Slade Point Reserve for Natural Resource Management is a well-visited 75-hectare reserve close to Mackay with a network of walking trails traversing dunal grasslands, melaleuca swamps, beach scrub (littoral rainforest) and open eucalypt forests. Much of the coastal lowlands of the bioregion have a long history of clearing for sugar cane and pasture. In heavily cleared areas, native vegetation communities have been reduced to remnant patches, which are effectively ‘islands’ in a sea of cleared land. The first areas selected for clearing were the once extensive open plains dominated by Blady-Grass Imperata cylindrica with large widespread Blue Gums Eucalyptus tereticornis, Poplar Gums Eucalyptus platyphylla, Swamp Box Lophostemon suaveolens and Tea Trees Melaleuca viridiflora, now almost completely replaced by cane. Animals such as red-cheeked dunnarts and koalas, once common in these habitats, have since disappeared from most of their former range in the bioregion. Whilst the coastal hills, ranges and uplands still support large areas of rainforest, lowland rainforests on the fertile alluvial plains are now mostly cleared. The Environmental Protection Agency recognises 60 of the 75 regional ecosystems of the Central Queensland Coast bioregion as ‘endangered’ or ‘of concern’ based on their remaining extent and threatening processes such as weed invasion and development pressure. In coastal areas, exotic grasses tolerant of standing water, especially Para Grass Brachiaria mutica and Hymenachne Hymenachne amplexicaulis threaten high biodiversity value wetlands and the Penny-leaf Tree Dalbergia sissoo is becoming a widespread woody weed in remnant vegetation. Twenty-nine animal species and sixteen plant species are declared by Queensland legislation (Nature Conservation (Wildlife) Regulations 1994) as endangered or vulnerable species and over 60 flora and fauna species are listed as rare. Habitat loss and fragmentation has had a major impact on the biodiversity of Central Queensland, however other factors such disease and global warming also threaten the long term survival of many plants and animals in the area.